Well it has been a heck of a week. First, let me underline the fact that I’ve had a cold/bronchitis since Thanksgiving, and have been hacking my lungs out. Second, on Thursday morning Roy broke loose from his leash AND collar to bolt after a pug across the street and got hit by a car. I saw it happen as I stood there with his broken collar in my hand, and I have to say that’s probably the worst thing I’ve ever seen. The car braked but still hit him, and Roy skidded across the pavement twitching and convulsing and snapping at the air. I ran to him and in his panicked state he bit my hand, but two seconds later he was completely calm and still. Thank God I wasn’t freaking out right then. I kept my head and instantly checked his spine and major bones, and made sure nothing was protruding and he didn’t have any major open wounds while talking soothingly to him. 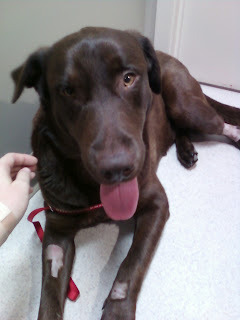 He only had a few minor scratched, but he wouldn’t stand on his front left leg. The moment the car hit him nature had kicked in and his hind part was completely wet and soiled. The woman who had been walking the pug yelled, “Do you want me to call a vet?” and I said yes. The man who had been driving the car got out and just felt awful, but I assured him that his collar broke and it was not his fault. I was about two blocks away from our apartment, and once I got Roy to stand a bit I lifted all 80 pounds of him and began to carry him back. I had to stop and put him down a couple of times, and made it to the door of the apartment when my arms told me I couldn’t go any further (80 lbs is a lot of dead weight for a girl that doesn’t work out! That’s two full bags of dog food!). Thank God the woman with the pug came and found me (without the pug) and told me what vet she called, and offered to stay with him while I went and got Matt. As we took him in, he never whined or whimpered but was totally calm and submissive. The vet came out and handed us a list of things they wanted to do for him and the total came to almost $800! At that point, of course, we signed—but Matt being the logical one was already looking in the future. What if he needed surgery or more? I didn’t start crying until I had ran into the apartment and got Matt, but I didn’t stop crying until I went to sleep that night. The first report was that he may have nerve damage, and needed an MRI, and had a broken shoulder which would require surgery. He also potentially had damaged his liver and lungs. We were potentially looking at costs of $4-6,000 or more. December 11th was probably one of the longest and hardest days I’ve ever experienced. 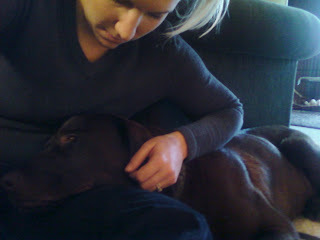 I know we had only had him for a short period, but I was definitely attached to him and him to me. I couldn’t take three steps without him moving with me and plopping down with a happy sigh on my feet. But the reality was if we couldn’t afford to take care of him, we’d have to put him down. We went home and I put my bloody and soiled clothes in the washing machine, and Matt and I crawled into bed and just lay there, praying (and I crying). After work I went to visit him, and he was happy as a lark when he saw me. He was in a kennel near the floor and hooked up to an IV, but when I opened the door and sat down he wiggled his way over until his head was buried in my lap and his tail was thumping happily. I had to figure out how to get him back inside when I left, and then he was standing up and trying to follow me out. The thought that we might have to put him down because of finances absolutely made me sick. After I left, I couldn’t eat anything and went home and just got in bed and cried myself to sleep. I cried so hard my face hurt. When Matt got home we talked (I cried) about it, and we knew this was a trial in our marriage—we do have different views on dogs. He sees them as pets and I see them as companions, and there’s nothing wrong with either view. But we don’t have that much money, and to put ourselves that much deeper into debt over an animal was a hard thing for Matt to swallow. We finally came to the conclusion of a price limit—I know it’s harsh but that’s what we had to do to be unified and on the same page. We were even looking up financial aid for pets online. The irony is we were going to sign him up for pet insurance that day. I know animals are just that—animals, but they’re God’s creatures too, and it made me physically sick that a dog that was so happy and full of life might have that taken away because of finances. All we could do was pray hard for a miracle and wait until morning. Morning came and as I moved to get out of bed my body absolutely yelled in pain. All my muscles—my biceps, quads, back—everything had been strained to the max when I carried him that far, and the adrenaline didn’t quit until night and then holy moly! I’ll never be so glad to get in an Epsom salt bath as I will be tonight! Around 9:30 the vet called, and as it turned out he didn’t need a MRI, had feeling in his foot, and may not even require surgery. Now this vet has absolutely given us a run for our money--$50 to take his blood pressure? With a machine? (I testily told the assistant that I could have done that myself with a second hand watch) $40 to clean each little scrape he had?! It was ridiculous! So I flat out explained that him needing the surgery or not was a matter of his life...and I did it all without crying and very firmly. He said he would call when he heard back from the orthopedic surgeon who was looking at the X-rays. This ray of hope was almost too much to bear. I steeled myself for the worst and waited for six long hours before calling again. Well, my friends, God still does work miracles. The surgeon thought that surgery wouldn’t really benefit him, and the best thing for him would be house arrest and rest! Their only concern was that his heart might be bruised, and so they needed to keep him one more night and run an EKG on him. But, they hadn’t heard anything negative so far, and said we could most likely take him home tomorrow (Saturday)! When I asked what the full total was, it was less than half our agreed limit. I went tonight to see him again and this time they had me wait in a room—then here he comes hopping on three legs with his tail wagging—my Roy Boy. His whole body was wriggling so hard I was amazed he could still stand on just the three legs! The vet assistant left me alone with him and I sat in the middle of the room as he hopped in a circle around me like he was saying, “Look mama! I can walk!” I grabbed his ears and snuggled his face calling him a big showoff, and he just licked me from my nose to my hair giving me an attractive cowlick. Then he settled down for a good long face rub with his eyes half closed and his tail smacking the door and the drawers on the wall like a metronome. He has a little cough but they said that will heal in time, and he’s even trying to move his foot forward when he walks which shows that there’s probably not any nerve damage! We’ll most likely bring him home tomorrow, and then comes the huge task of keeping a 2 year old lab who likes to follow you everywhere laying down most of the time for the next 6-8 weeks. I bought a crate tonight, along with a plethora of bones and a soft cuddly toy (can you blame me?) in order to keep him in one place, and when we’re not there have a hard bone to keep his attention for a good period of time. I also bought a strong training collar for when we’re outside—even with a broken shoulder I still don’t trust him! Yesterday as he was in my lap another pug at the vet was being walked by and he tried to go to it! Crazy dog…you think he’d have learned to stay away from pugs. So that’s my Christmas miracle. I told Matt to just tie a big red bow on him come Christmas Eve ‘cause that’s all the gift I wanted! Please keep him in your prayers as he’ll still be recovering, and that he won’t need any further medical attention. Pray we learn how best to handle keeping him down and calm, and that he takes to the crate well. Pray for us to have patience with him, and that he heals up fully so he can go hiking and backpacking with us like we so want a dog to do that with. He’s definitely got the energy! And if you think God doesn’t care about animals guess again—I believe this was nothing short of a miracle and a blessing from God for us.